Our sense of smell is one of the strongest ways we connect to our memories. Pine needles conjure up the holiday season, rosewater soap takes you right back to Grandma’s house, wet earth for spring and pumpkin spice for autumn; it goes on and on. 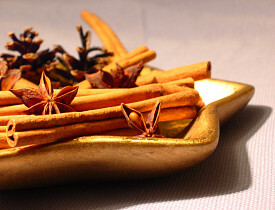 Simmer a variety of spices such as whole cloves, cardamom pods, fennel seeds, etc, in a pot of water on the stove. They’ll fill every nook and cranny with a warm, spicy, autumn-y aroma. To shake it up a bit, throw some orange slices in there. During the winter, use pine cones, dried rosemary branches, and cinnamon sticks as scented natural kindling in your fireplace. These awesome little fire starters will leave the whole place smelling quintessentially seasonal. Aromatic plants like jasmine, honeysuckle, and tuberoses can all be grown indoors. Herbs such as rosemary and mint are also easy houseplants, though they’re less fragrant then their flowery alternatives. A beautiful bowl of potpourri is perhaps the most straightforward solution to scenting up your abode. The mix can be made from any number of flowers (think roses, lavender, and chamomile) or herbs (lemon balm, peppermint, cinnamon sticks, and rosemary). Add fruits, such as lemon or orange peel, if you like. Make sure all ingredients are completely dried before using. A sachet is just a small bag filled with dried, freshly crumbled herbs. Lavender, sage, or spearmint are all lovely choices. Sachets can be thrown in the dryer to freshen up your laundry, or to perfume drawers, chests, and in other small spaces that hold clothing or linens. Many herbs, like lavender, have natural pest control properties. To freshen up your carpet or rug, combine 6 parts baking soda, 3 parts dried ground lavender, and 1 part cornstarch, then set aside for a few days. Once it’s fully steeped, sprinkle the concoction over your carpet, allow to penetrate for at least an hour, and then vacuum it up. Mix 1 part dried, freshly ground herbs (use a blender or mortar and pestle) with 1 part baking soda. Sprinkle a bit of the powder mixture directly onto your mattress each time you change the sheets. You’ll notice a lovely, subtle smell that permeates your resting place.